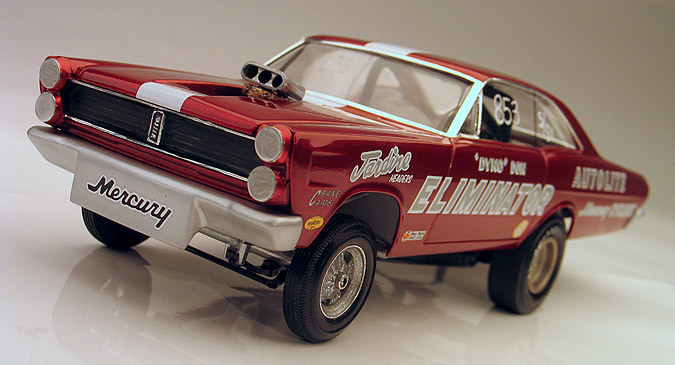 When the old AMT altered wheel base drag cars were recently re-issued I jumped at the chance and bought them all. These are really cool kits and I have enjoyed building them. They are pretty simple “old style” kits but with a little detailing they really capture the right look of the golden era of drag racing. 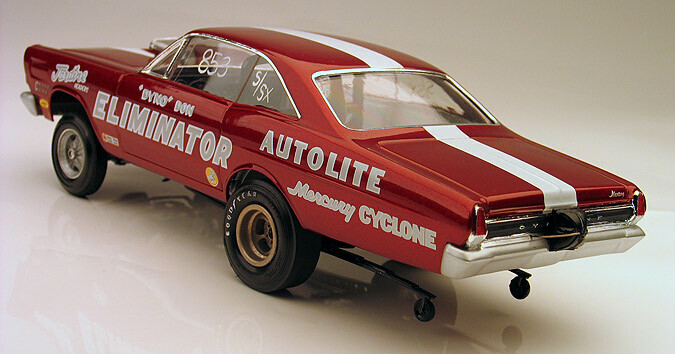 This particular model is based on the Model King Cyclone kit. Because the kit is not based on a real car and the decals inside the box were pretty lack luster I browsed through the Slixx web site and ordered their Dyno Don ‘67 Cyclone decals. Although the real car Dyno Don drove in 1967 was a funny car and not an AWB car I decided to use them anyways. So, my model is built as a “what if” car. It’s in the spirit of the era if not completely accurate. Mostly, the model is built from the box. Using reference photos of his funny car, I did add a few details to match his car better. First, I added Halibrand front wheels from a Polar Lights funny car kit. Front tires came from my parts box. I also modified the front bumper by filling in the turn signals and added the molded in air dam. The Model King kit has a deep set custom grill that doesn't really look correct for a '67 Cyclone. I took a newer issue stock AMT/Ertl '67 Cyclone kit and foil cast the grill section and then added it to my model. I think it looks a lot better. For the headlight covers I happened to have a hole punch that was the right diameter, so I used it and punched out a set from sheet styrene. Another dig through my parts box also turned up a better looking blower and injector scoop then the pieces found in the kit. I also made side windows from clear sheet acetate and hand lettered the class numbers. For paint I airbrushed a coat of Dupli-color primer followed by a base coat of House of Kolor Pagan Gold and finished off the body off with six coats of HOK Candy Apple Red. Final detailing included adding photo-etched hood pins and wiring for the parachute.